As one of the first women to graduate from United States Military Academy (USMA) at West Point, Sara learned lessons first hand through challenging situations that illustrate several poignant and modern principles about leadership and character. 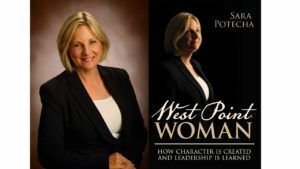 West Point Woman is a leadership memoir for readers at all levels of organizational leadership, and applicable across industries, genders and professional expertise. • What are the LEADERSHIP SKILLS that the first women at West Point learned, which helped them succeed in an often-hostile environment? • What are the LEADERSHIP PRINCIPLES that make a West Point woman resilient and extraordinary, and how might you incorporate those tenets into your own leadership repertoire? As an exceptional storyteller, sought after speaker and leadership practitioner, Sara will arm you and your organization with the essential leadership skills needed to fight the “battles” of your current experience. Cathy Fyock, was instrumental in the writing of my first book. Initially, she helped create a laser focus for the scope of the book. This act alone saved me enormous amount of time, effort and frustration. Next, she encouraged me to simply write and applauded those first, feeble efforts. She made me accountable to produce written works each week and in short order, my draft emerged. She next connected me to other authors, so I might learn from them. And then she introduced me to my publisher, Kate Colbert of Silver Tree Publishing, who ensured my book was on the market within months of when the final manuscript was completed! I would highly recommend Cathy’s services to those who make it an ambition to see a book written and published! To order this book follow this link.